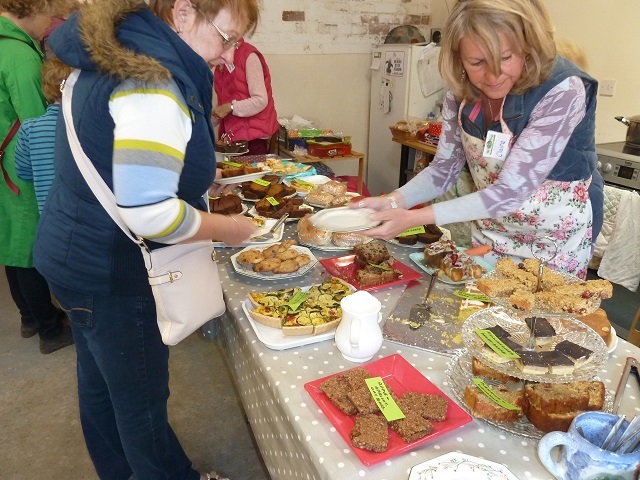 The sun shone, the mulled apple juice was brewing and stalls were set up in our 'lamb barn', while the cafe team served hot soup and a delicious variety of cakes inside at our Christmas Fair. We felt blessed and delighted by the turnout so a big thank you to all of you who came and supported us. 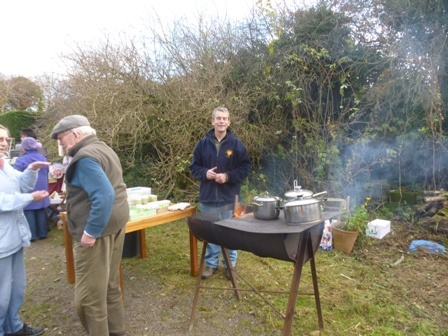 Stall holders were happy about the new venue, remembering last year when we shivered in the yard despite the brazier going. 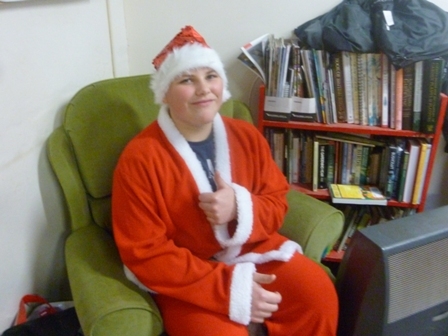 Another addition this year was the presence of an experienced Santa who sat in his grotto with lights twinkling on the branches behind. It really felt like the build up to Christmas has started. 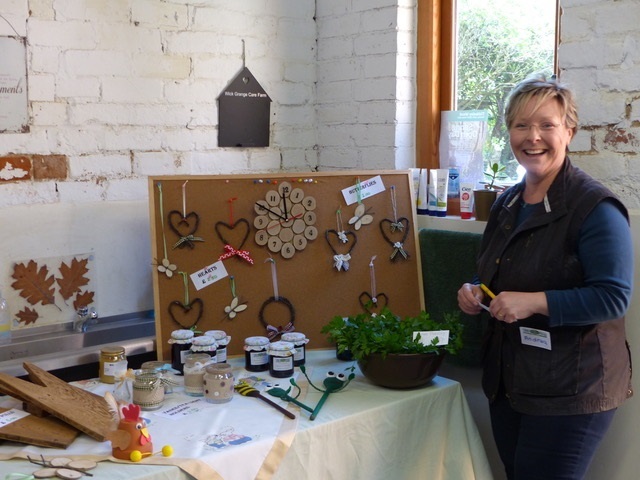 Preparing crafts and preserves for our events has been a welcome focus at the Care farm in the last few months. New volunteers have brought new skills - needle felting and willow work; it has been interesting and satisfying being able to use other natural materials especially using some of our wool. My name is Rose. I am nine years old and live near Pershore. 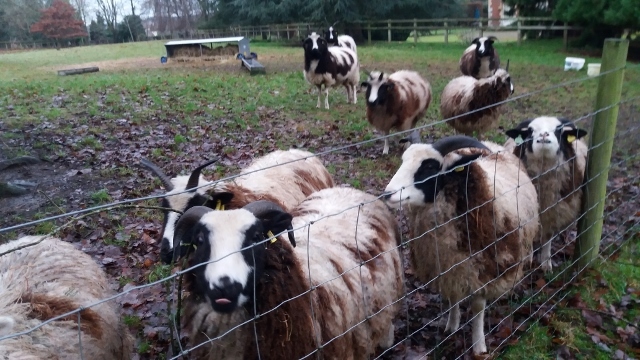 I have visited the care farm over the years with my home educated friends. There is a lot to learn at the farm. The animals and the people at the farm are all very friendly. 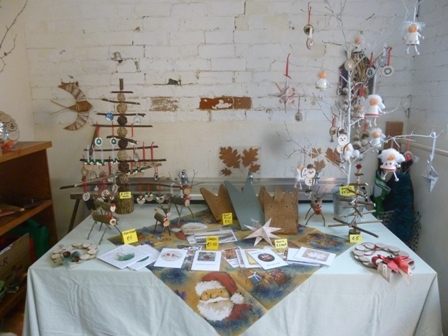 I visited the Christmas Fair there this weekend. There were lots of cool Christmas gifts and decorations to buy. There were lots of yummy cakes to eat and also hot spicy apple juice. My Mum bought a small real Christmas tree with lights on and I won a paint and glitter your own piggy bank in the raffle. Santa was there with some sweets too. It was a cold but sunshiny day and I enjoyed my visit. I would say it is a really good place to visit. 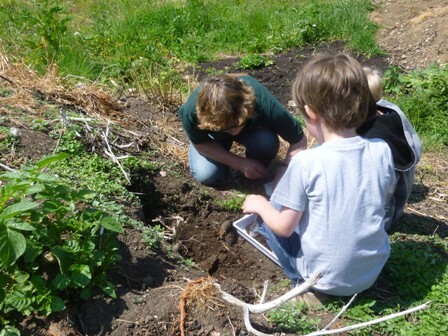 My name is Laurie Archer and I am 12 years old and have been volunteering at Wick farm since I was 10. Today I will be writing a little about the fundraiser that was held on Saturday, 23rd of September. 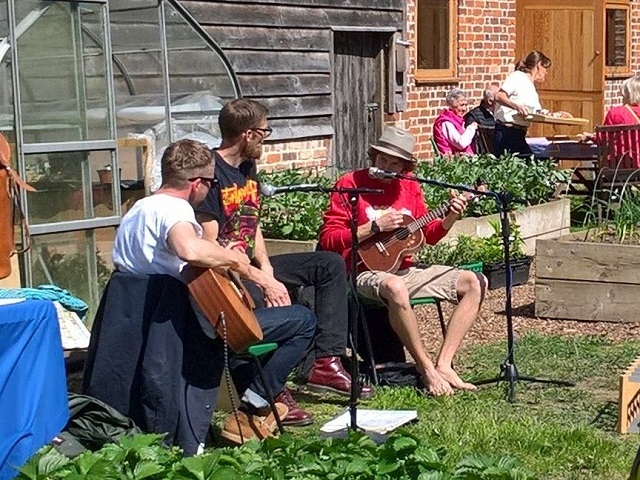 Proceeds were divided between supporting projects at Wick Care Farm and the Alzheimer' s Society. When you arrived at the farm, you were greeted by a friendly warden who showed you to your parking spot. In the main yard, there was much to see and do! There were stalls selling unique, fun things and everyone on the stalls was very friendly. 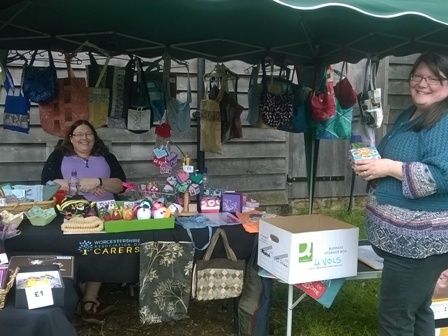 Wick Care Farm events are free entry and free parking and you also have many chances to take part in competitions including a tombola and a free prize draw. 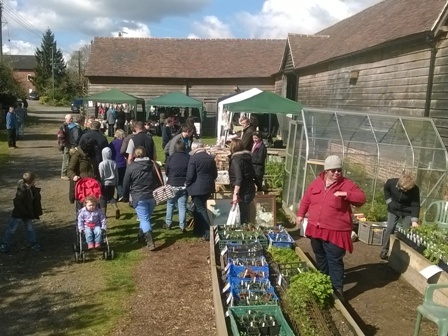 There are farm animals to visit including pigs, sheep, chickens and geese and there are garden plants for sale. The lovely thing I feel is that everyone who is there to help is volunteering! The age range is big too. There are volunteers, me included, who are still kids, but what I find great is that regardless of age, everyone has an equal role. The range of tea and cake were to die for! All of them made by volunteers and lots of people said they tasted GREAT! I served tea, coffee, cold drinks, cake, sandwiches and soup. There was lemon drizzle, chocolate, fruit, red velvet and fairy cakes, and that’s to name just a few! There was also a fantastic range of gluten free cake too. Being gluten free, sugar free and dairy free, it’s hard to eat out and I still found a wonderful cake that was free from all three! I loved it. Well, that concludes my piece for now but I help at all sorts of events that the farm hold. So, if you fancy swinging by at any of our events, I might just end up serving you in the tearoom! The next event is the Christmas Fair on Saturday November 25th between 11am-2pm where seasonal food and drinks, plants, gifts, wreaths, chutney and jams will be for sale. Until then, goodbye! 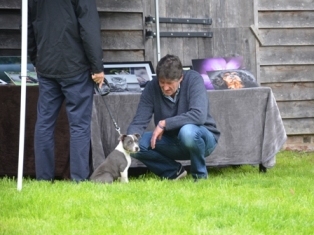 Andy Nash from PKA Photography showing his skills at dog charming.. 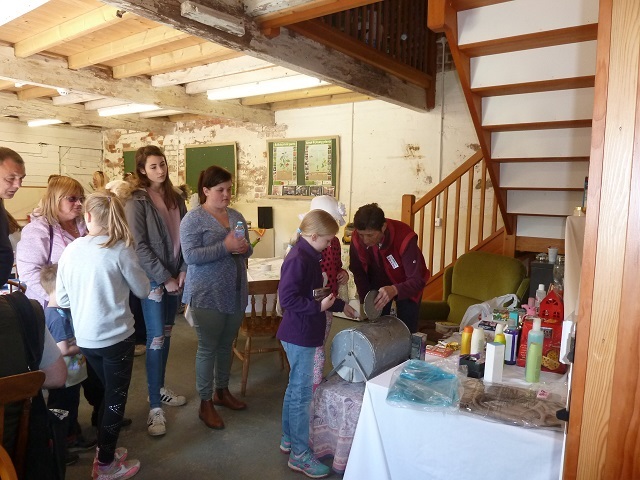 I am Laurie Archer, an 11yr old Home Educated child from Worcestershire and I volunteer at a few of Wick Care Farm’s events and today I am reviewing the 2017 Open Farm Sunday. 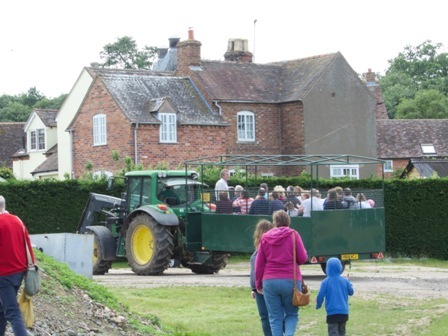 Open Farm Sunday is a nationwide festival to celebrate farming across Britain. There are 50,000 farms across the UK yet sadly only 400 took part in this special event which means having Wick involved is even more special! 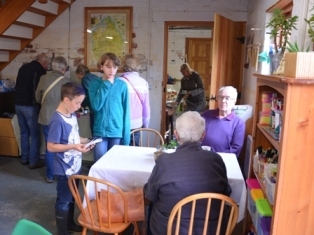 On Open Farm Sunday, Wick Care Farm was abuzz with people. 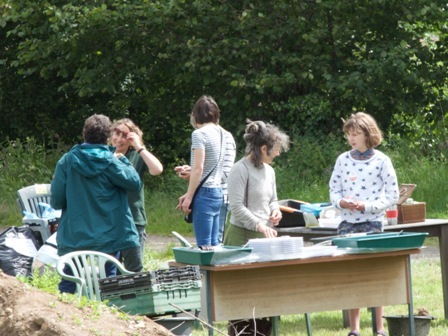 The volunteers provided a trail, served tea and cake, offered fun with soil experiments and there were tractor rides too! So, whether you are young, old, or just in the middle, Wick had something for everyone. While I was volunteering, I observed the goings on in order to write a review of the day. When you arrived, you were directed to the car park by a friendly traffic warden, one of which was my 9yr old brother. 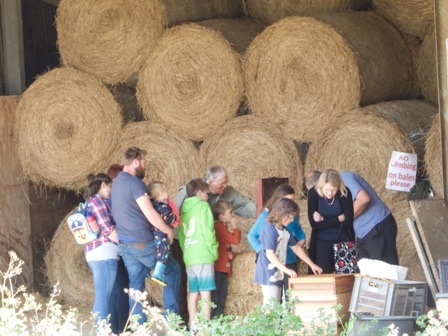 After that, you made your way to the yard where on your left, there was a craft activity tent, a live bee demonstration and a massive tractor to ride. You sat up high in the trailer, munched on home grown peas, and watched the view go by! After that, there was a wide range of craft and science experiments to try - from muddy fun to sticky glue! And if that wasn’t enough, there was an amazing trail for the whole family to enjoy. Follow the flour and you can’t get lost! The trail took you round the fields, across the farm track and through the grass. 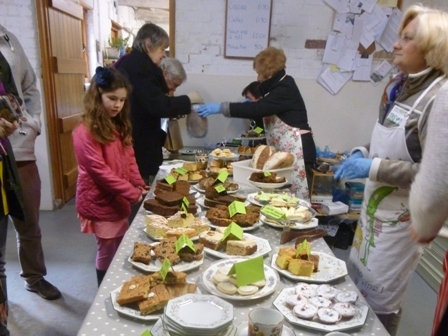 After the walk, (and you’ve collected your sticker) you could walk into the barn and enjoy a wide range of delicious cakes! From scones to lemon drizzle, the café really had it all. Everyone is very nice and always happy to help whenever you have a question. 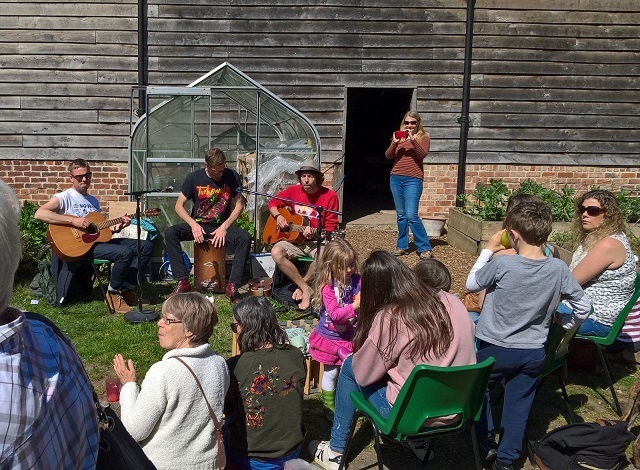 Now you have seen what an utterly incredible place Wick Grange Farm is, I hope you can attend one of their future events soon! 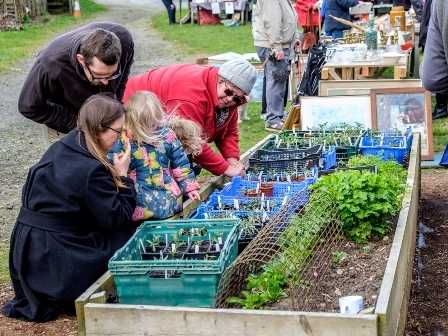 Wick Care Farm Welcomes Spring with a Pop-up Market! Everyone here has been very busy over recent weeks preparing for the “big day”. 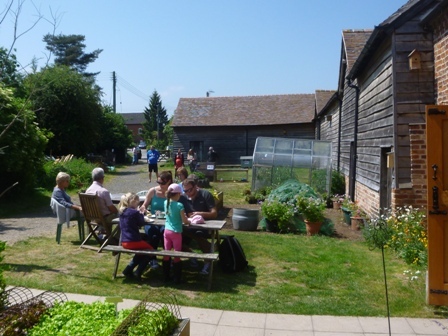 We have been mowing, planting, potting on, baking and DIYing in readiness. Our animals have all been educated in how to 'Meet and Greet' our guests; all but the geese have been very welcoming! We never cease to be amazed at the generous support we receive from friends of the Care Farm for which we are hugely grateful. Donations of raffle or tombola prizes were plentiful and tickets were easy to sell thanks to the quality and quantity of prizes on display. Our Café once again was extremely popular and the choice of delicious treats on display made choosing a very difficult task, even for those who are gluten or dairy free. A light lunch of homemade quiche, soup, or filled rolls also proved a winner. Laughter and chatter could be heard all around. Families were able to spend time communing with the animals or playing skittles and the marble game, which added a new dimension. 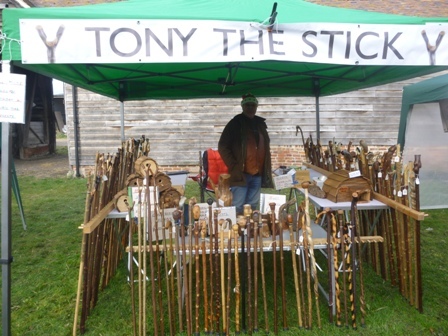 The market stalls offered a wide variety of beautiful hand crafted items including jewellery, walking sticks, sewn items and lip balms, as well as plants, cards, preserves and honey. We raised just over £1500, which is fantastic! This money will be going towards a second wood burning stove, in our craft/cafe area, and fencing for the animal enclosures. Our next market will be at Christmas - Saturday November 25th, same time, same place with a Christmas theme. If you would like a stall, please be in touch..
By the end of the day, we felt exhausted but, more importantly, we felt immensely proud to be part of such an amazing team! Having gradually increased our days for regular groups, we are now open four days a week. Our groups on Monday/Tuesday/Thursday are mostly for adults plus one or two places each day for students referred from local high schools. Although we like to keep the family feel by keeping our numbers small, we have decided to offer an additional ninth place on each of these three days which means we now have spaces available. On Wednesdays, during term time, we have students from three local high schools. Our friends Lorna and Jerry from Elmley Castle did an amazing job with their lambing this season; as a result, January saw the arrival of eleven orphan (cade) lambs at the Care Farm. 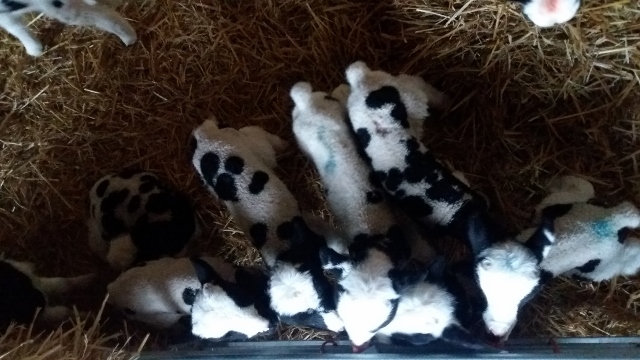 It’s lucky there is not much planting or watering to be done at this time of year as bottle feeding and exercising these little bundles of joy has been the main focus for our regulars; plus a sudden surge of educational visits. If you haven’t already, take a look at our Facebook page to see pictures of us with our lambs. 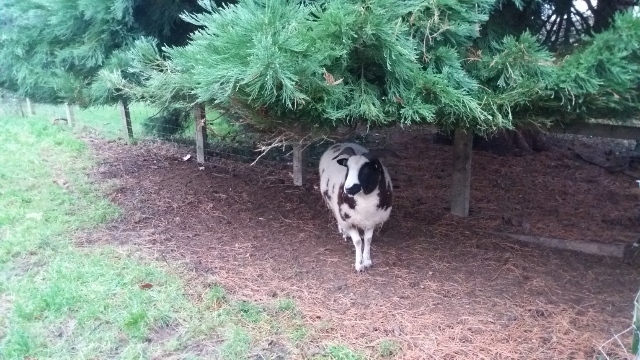 We are also grateful to Lorna and Jerry for the loan of handsome Hercule the Ram back in November 2016. All being well, we will be lambing our own ewes any time from 1st April. Ed has been booked in to fence off a paddock for our lambs to go out in so we can convert the lamb barn into a lambing barn. 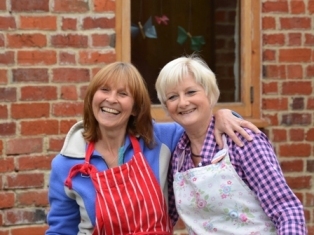 A new and exciting experience for everyone at the Care Farm! 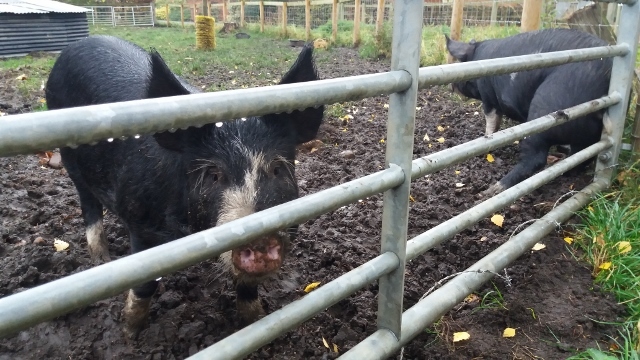 Our Berkshire pigs have now left the farm to make room for two new piglets due in April. 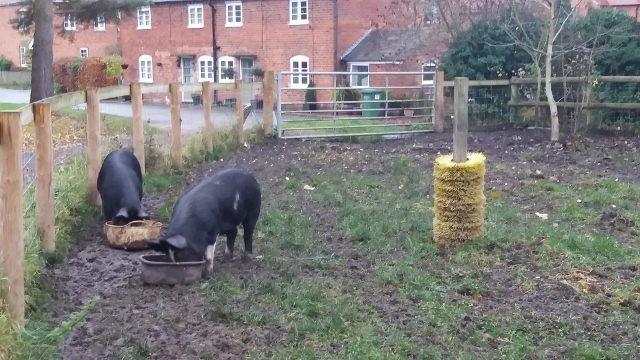 Having worked with various breeds of pig at the Care Farm over the years, we all agree that the friendliest pigs were our Large Blacks from Mike at HMP Hewell. These lovely girls would happily roll over to enjoy a good belly rub and we are awaiting news of a new litter. If anyone is interested in sponsoring a pig for your freezer we will be glad to take care of everything for you. This spring, as in previous years, will see us incubating any fertile eggs we are lucky enough to be donated. 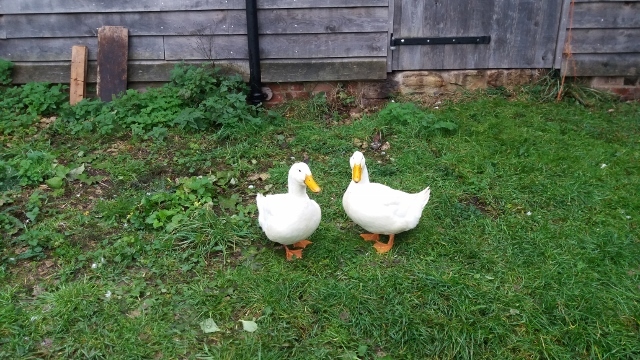 We are hoping our ducks will decide to sit on their own eggs once the weather warms up, and we will be buying in twenty day old chicks to raise and sell on as point of lay pullets. As well as caring for our animals, we try to be as self-sufficient as possible. Seeds will be sewn and potting areas are prepared. When the seeds begin to sprout and grow we hope to end up with a wonderful variety of fresh herbs, salads and vegetables to use in our delicious home-cooked lunches. We also like to grow flowers to decorate our dining table and give the place a homely feel. 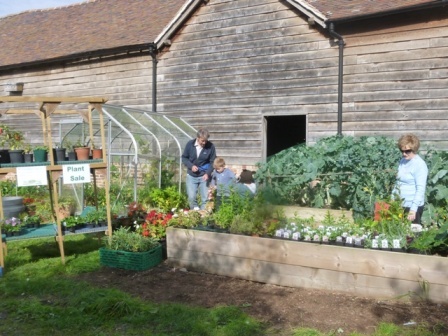 The polytunnel which we fundraised for in 2015 is a tremendous asset. It provides a space, whatever the weather, where we can work. The more physically active of us have helped to build and fill some new raised beds. The less physically active of us enjoy sitting under cover to plant seeds and bulbs. 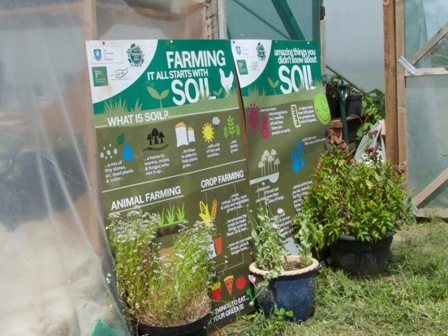 The process of planting, growing, harvesting, preparing, cooking and eating our own produce offers huge health benefits for everyone at the Care Farm. With self-sufficiency playing such an important role, it is our aim to introduce a wider variety of fruit onto the farm. 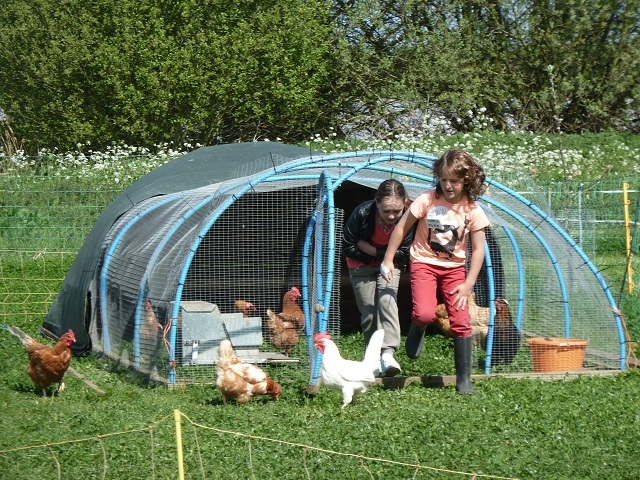 We plan to build a fruit cage, plant an edible hedge and create a small orchard of apples, pears, plums and cherries which will also provide some shade for our free range hens. 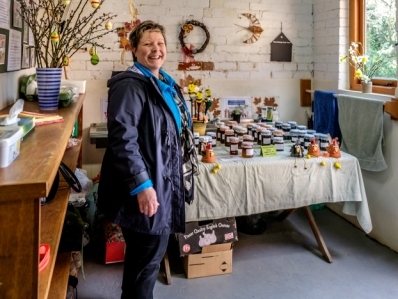 It’ll be great to make pies, crumbles, jams, chutneys and jellies from our home grown produce. 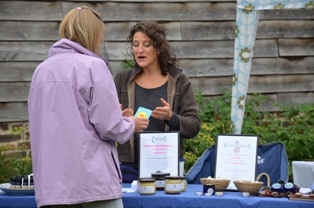 You can buy our Care Farm preserves at our next Pop-up market on Saturday 22nd April. Keep an eye on our website for more details about this forthcoming event. Don’t forget to keep up to date with what we’re doing at Wick Care Farm by following us on Facebook – find the link on our homepage. 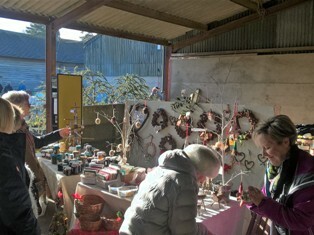 We had an absolutely lovely time at our Christmas Market on Saturday 26th Novemeber. A BIG thank you to all who helped, supported and donated towards the day's success. Thank you to the stall holders who joined us, and an even BIGGER thank you to all who attended. We hope you enjoyed it as much as we did! 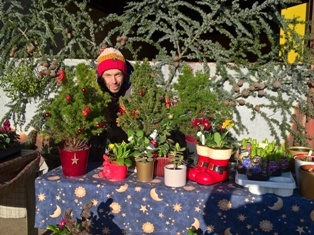 Plants for sale with a smile! 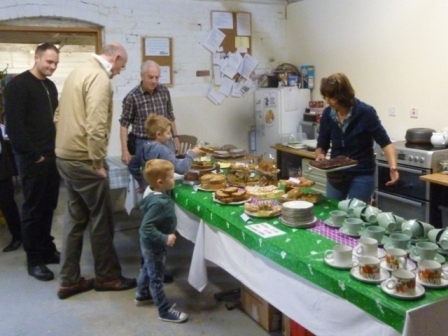 On Saturday 24th September, Wick Care Farm opened its gates to raise money for Macmillan’s World’s Biggest Coffee Morning. Having had a very successful event on the previous two years, the team were prepared for a busy morning. 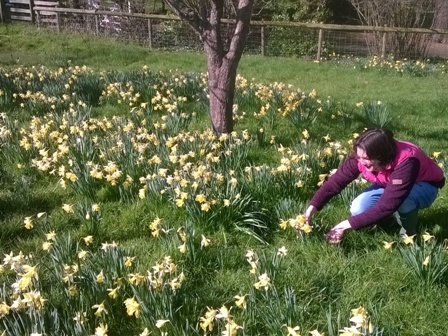 The field had been mown into a car park with volunteers at the ready with a warm welcome and clear directions. 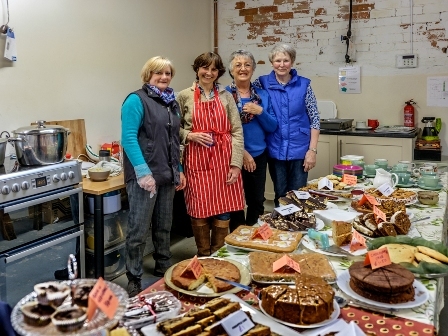 Inside, the tables were groaning under the weight of a delicious array of home-made scones, flapjacks and cakes of every flavour with not a single soggy bottom in sight. The smell of fresh coffee percolated the air as the first guests were greeted and faced with the difficult question of which cake to choose. The tables looked delightful dressed with colourful table cloths and flower arrangements. Raffle tickets were in great demand thanks to the many donations of desirable prizes. 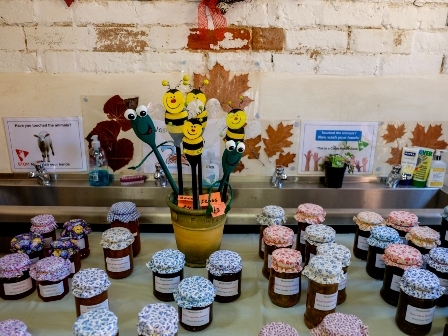 The Care Farm used the opportunity to sell some of their jams, chutneys and plants and to invite the local community to enjoy their facilities. 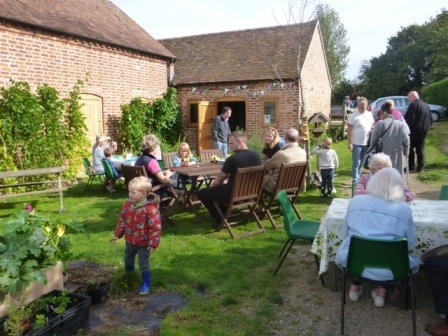 Tours of the Care Farm were another popular aspect of the morning with people, who benefit from attending this Day Opportunity, keen to show visitors around and tell them how they enjoy being part of this very special place. Visitors were introduced to the animals and amazed by the variety of tomatoes and other plants being grown there. 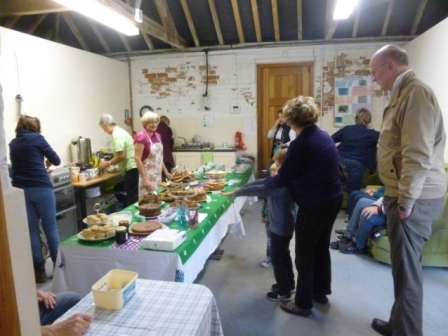 As the final visitors drove away with happy smiles and plates of cakes, the money was counted and a grand total of £604 for Macmillan was announced with Gift Aid yet to be added. The team at Wick Care Farm want to say a massive thank you to everyone who supported this worthwhile event and look forward to welcoming one and all to their Christmas Market on Saturday 26th November. 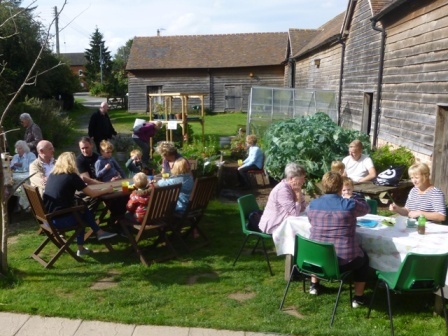 Open Farm Sunday turned out to be a great success. 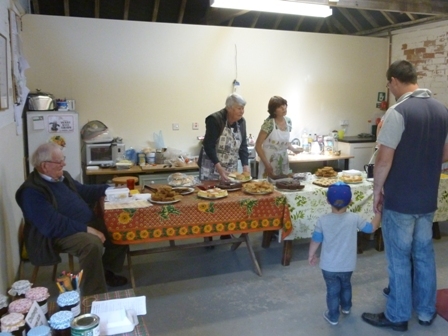 At least 200 people came and had a look around and took part in the activities on offer. There was a great mix of people of all ages from babes in arms to grandparents and seniors. We were lucky with the weather which made it easier; however, a few people said it was too hot to walk the mystery trail! Tom, aided by Zac in the trailer, did not stop doing trailer rides - 7 times they set off with a full load down to the river where they ate peas and listened to Tom answer questions on the farming, wildlife and conservation. 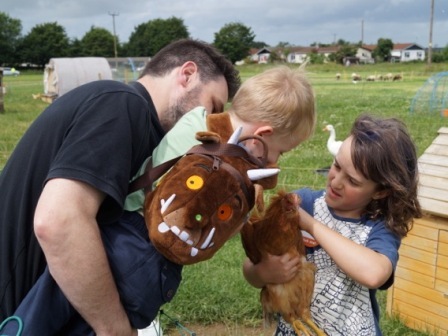 The Care Farm animals proved very popular too, especially the ducklings who looked cute and quacked away merrily and our large black piglets who performed to order by lying down to have their bellies rubbed when given the right fuss. 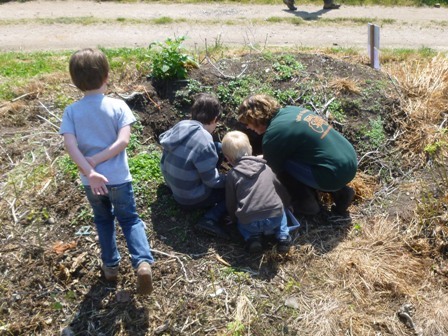 Other activities included a mystery trail, planting bean or pea seeds in a newspaper pot, a pollinator survey, looking at a beehive and equipment, handling and experimenting with different types of soil, digging for mini-beasts and crafts. There was a steady flow of people seeking refreshments and the atmosphere was happy and relaxed. Many thanks to everyone who came and for all the positive comments made on the feedback forms. Also many thanks to all our helpers - we could not have done with out them.... We hope to do it again next year. 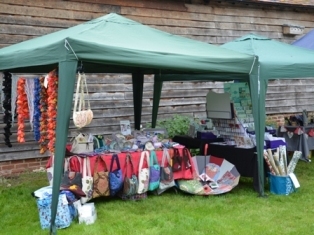 Pop-up Market – a great success! 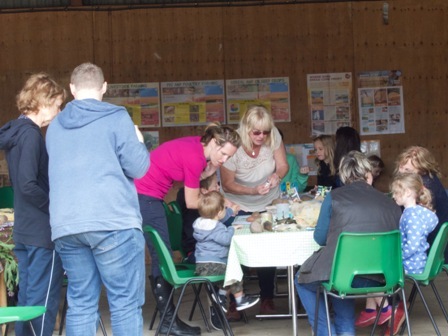 There was fun at the farm last Saturday, as Wick Care Farm threw open its doors to host a pop-up market and café. 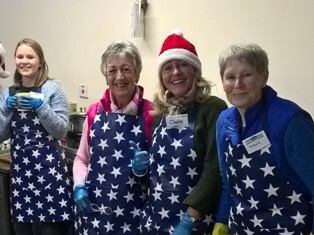 The event was a great success, so Isobel and Jo and their team would like to say a big thank you to everyone who supported it, both in the run-up and on the day itself. 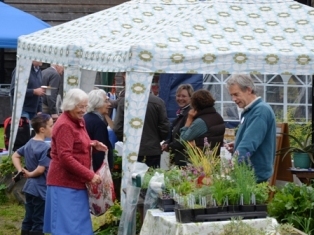 There was a range of stalls offering plants and produce, crafts and curios. Some of the wares were made ‘at home’ on the Farm, while others were brought to us by friends. 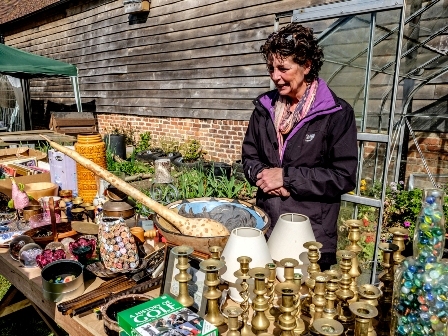 Everything looked wonderful, and special thanks must go to our visiting stall-holders – the market just would not have been the same without you. The café proved extremely popular, and no wonder! 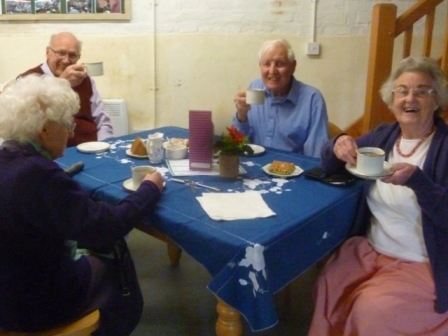 Besides hot tea and coffee, our visitors enjoyed lovely home-made soup and rolls (with real butter! ), and a table laden with fabulous cakes. The only difficulty was deciding which to choose, but with plenty to go round there was no need for anyone to stick to just one! 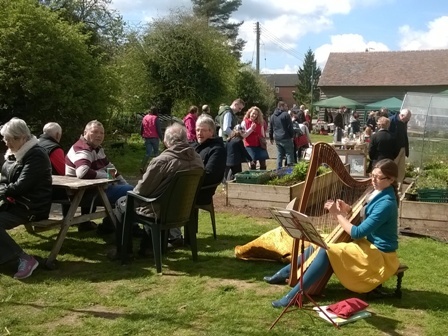 While the sun shone and the live music(many thanks to Marianne Fisher) played outside, the swallows flitted about above the barns and everyone made the most of a beautiful English spring day. Our animal stars had many fans. 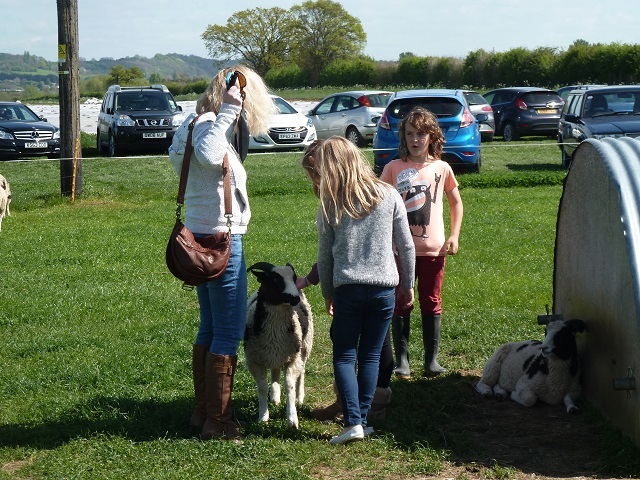 Our lambs, piglets, chicks, sheep, geese, hens and ducks were all ready to be admired, and it was lovely to see lots of people enjoying meeting them. 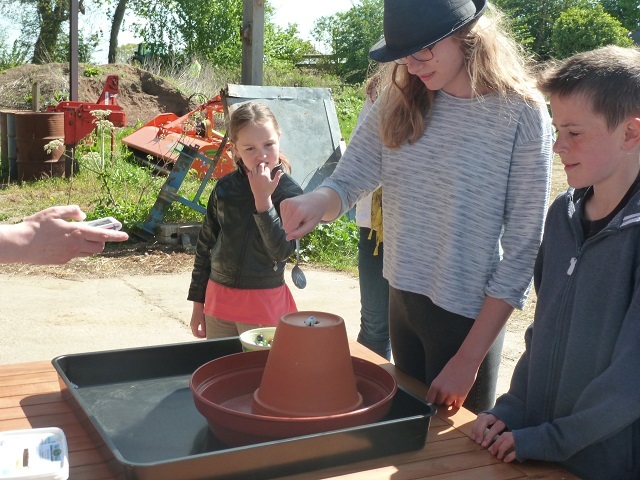 Many visitors also went on a tour of the Care Farm, to discover what’s going on in the polytunnel, what’s growing in the vegetable patch, and who’s living out in the fields. The day ended with a raffle and prize draw. First prize in the draw was a gorgeous hand-made quilt, made by and kindly donated by Bobbie Turley. Also thanks to other kind donators of prizes including K&J Mason of Pershore Market who provided a basket of fruit. Well done to the winners. When the numbers had all been drawn, the stalls taken down, and the tables cleared, it was time to count the takings. On the day we took £1,300 which is absolutely fantastic. 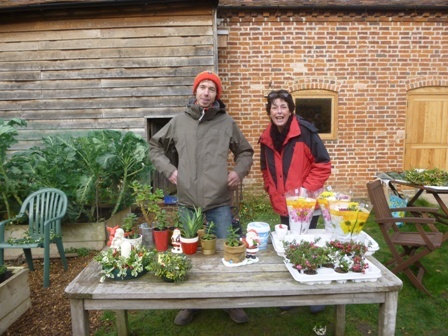 All proceeds will go into improving the facilities of the Care Farm. Thank you for the photographs by Judy Knight. What a beautiful sight... These wild daffodils have done really well this year. All site content copyright © WickGrange.co.uk 2014. All rights reserved.